Food Preparation – You Asked It! Looking for a simple way to find seasonal foods? Look no further than Seasonal and Simple! This app, developed by the University of Missouri, also includes Kansas State University Extension, University of Nebraska Extension and Iowa State University Extension. The free app includes farmers market located near you, recipes, seasonal produce, and much more. Learn more at http://seasonalandsimple.info and download from your app store. 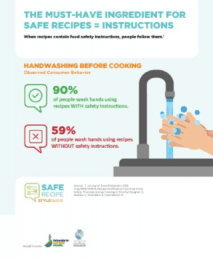 90% of people wash hands using recipes WITH safety instructions. For most cooks, the menu planning starts with a recipe. These instructions help guide the cook to a successful outcome. Including safe food handling instructions can also help! The Partnership for Food Safety Education has launched a Safe Recipe Style Guide to add text for temperature, handwashing, cross contamination and produce handling. Guidelines for adding food safety text follows the AP Stylebook and from the guidance of food safety experts and leading food journalists. The Style Guide is for any recipe writer. The text is simple and is added when appropriate for the recipe. It can be added with the ingredients list or in the directions. All recipe instructions should start with washing hands with soap and water. Professionals or adult and youth leaders and volunteers who teach baking skills in classrooms, libraries, public or private organizations, community youth programs, families, and youth teaching peers or younger ages are all eligible. Registration deadline is March 31, 2019! Food chefs on TV provide entertainment and fun food ideas. But, when it comes to safe food preparation, they fall short. Viewers follow what they see. When chefs handle raw meat, 88% did not wash their hands afterwards. For meat doneness, 75% did not use a thermometer to check the temperature. Chefs are often caught licking their fingers, touching their hair, and using the same cutting board for raw and ready-to-eat foods. Chefs must keep shows engaging, navigate time schedules, TV sets and crews, and still be relatable to the audience. Consumers can speak up, make chefs accountable, and focus on recipes with food safety messages. Think about where you use your smartphone, tablet or laptop. Do you use it in the kitchen? If so, the bacteria on those electronic devices could contribute to foodborne illness. While no incidences have been linked to electronic devices, it is good to be aware of the possibility. In the 2016 Food Safety Survey, conducted by the FDA in collaboration with the USDA, consumers reported taking electronic devices everywhere—work, the bathroom, the gym, shopping, just everywhere. Then they use them in the kitchen, usually to view a recipe to cook. These devices are so integrated into our lifestyles, that the thought of food safety does not relate to the consumer. What can you do? Wash your hands before and after handling the electronic device to keep hands clean. Some fruit pie recipes need help to get the filling just right. One solution is to add a peeled, grated, and squeezed dry Granny Smith apple which is full of natural pectin. Apples contain high amounts of high-methoxyl pectin and makes a great gel. In combination with two tablespoons of instant tapioca, the gel should have a pudding consistency. Crush some of the other fruit and combine with the grated apple. This helps release the natural pectin within the fruit cell walls to achieve a good gel. Grind or crush the tapioca to minimize the “pearl” look in the filling. The popularity of electric pressure cookers has brought up other safety issues besides food safety. One is about using Pyrex® inside the electric pressure cooker. According to Corelle Brands, makers of Pyrex®, it is not recommended to put this glassware in these appliances. The glass is not made to be put under pressure and it could crack or explode. If you have further questions, contact the Corelle Brands Consumer Care Center at 1-800-999-3436. “Find Your Fun” and have some fun with food! 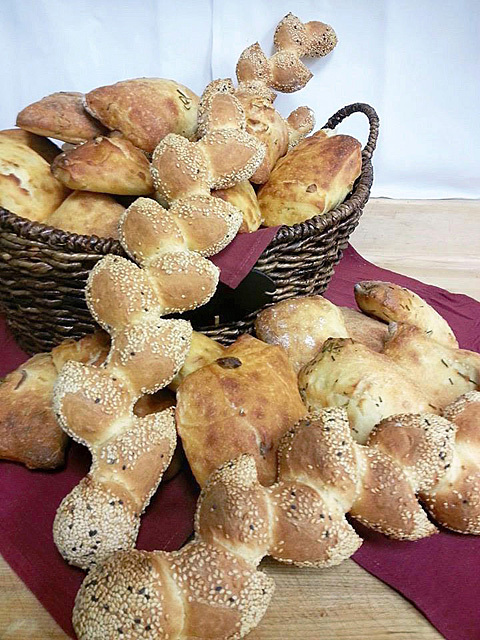 A new contest for county fairs and the State Fair has been developed by the Kansas Wheat Commission to bring out your creativity with bread sculptures. The Kansas Wheat Commission recommends having a county contest to send the winner on to the State Fair. But, individuals may still enter their item in the “Open Class” Bread Sculpture contest at the State Fair. Judges will consider creativity, originality, imagination, attention to detail, design, color, and instructions. There are many kinds of comfort food. But, the pot pie is one that has quite a history. A basic pot pie consists of a pie crust, poultry or meat, vegetables and gravy. It is a good way to use up leftovers for an easy meal. Prior to becoming popular in American cuisine in the late 1700s, the pot pie was a very “lively” dish. According to Smithsonian magazine, cooks from the Roman Empire era would sometimes make pot pies with a living bird that would burst through the pie shell when cut and fly out. Surprise! While this would scare any unsuspecting diner, this active meal was still prepared in 16th century England. Pot pies were also described as “Sea Pie.” This version typically included pigeons, turkey, veal and mutton. The name came from the pie being made aboard ships. In 1951, the first frozen pot pie was created by the C.A. Swanson company and was made with chicken. Other versions of pot pies have toppings made of mashed potatoes, mashed sweet potatoes, cornbread, biscuits and more. Are Your Dried Beans Old? It is soup season and many recipes include dried beans. But how can you tell if they are old? One specific sign dried beans are old, is if they wrinkle during soaking. As dry beans soak, they should absorb moisture through the hilum, the part of the bean that attaches to the pod. But during harvest handling and storage, dry beans can develop holes, called “checks”, due of temperature changes, moisture changes, and fungi growth. The “checks” allow water into the bean and wrinkle the skin. Since these “checks” are difficult to see before cooking, always buy new beans and use remaining dry beans within one year.